You can get your housing mortgage and eat smashed avos too. You’ve probably heard the joke about young Australians not being able to afford a housing mortgage down payment because they are too busy spending money on smashed avos and coffees at their local cafe. As ridiculous and flawed an argument it is, I would not expect anything else from the mainstream media. That’s awesome journalism by 60 Minutes on Channel 9. (Yep that is sarcasm.) Guess what?? You can get your housing mortgage and eat smashed avos too. Moving on from tabloid quality journalism, is the current state of the Australian economy. There have been signs the large housing bubble in Australia may be finally coming to an end. One of the triggers may very well be the interest only loans for the first 5 years. After 5 years, the monthly payment rate for interest only loans increase to include principle as well as interest. What will happen as a result of the increased mortgage payments? One of two things. The extra money required to go towards the mortgage payments will be taken away from the discretionary spending money. Normally discretionary spending goes towards things you enjoy, not need. The 5 year interest only limit has already started, but the number of loans effected by this are about to rapidly increase between 2018 and 2020. The other potential outcome is some people may not be able to keep up with their mortgage housing payments and default on their mortgage. Either way, the local economy will feel the effects. I would not want to run a business relying on peoples discretionary spending, such as a cafe. At a guess, things are most likely about to get a lot tougher. If you are required to cut back on your discretionary spending, there is no need to give up your favorite $AU18 smashed avo. You can quite simply, make your own smashed avo at home. Don’t fear, it is very easy. This quick 3 minute tutorial below explains how to make your own smashed avo. I took a trip down to the local supermarket to see how much it would cost me to create my own smashed avo at home. The total for all of the listed ingredients comes together at $AU14.12. If you were to buy a smashed avo in a cafe, your already ahead by at least $AU3.80. However, having spent $AU14.12 at the supermarket, do you know how many smashed avos I can make? At least 3 large sized smashed avos could be made with plenty of left over ingredients. In case you were wondering, I use full cream milk when making scrambled eggs. I mix it in with the scrambled egg yoke. Obviously this is not required, it is a personal choice. Hhmm, so $AU14.12 / 3 = $AU4.70 per smashed avo. That is a saving of $AU13.30. That’s a 73% savings over a $AU18 smashed avo. Keep in mind, that is with all of the ingredients. For a basic smashed avo, it would be even cheaper. Lets just say you only want a basic smashed avo. We will use multi-grain bread slices, eggs and an avocado. The total for these items comes to $AU6.30. Now divided by 3 for the three smashed avos you create (2 eggs for each smashed avo); the total is $AU2.10 each. You can make a simple smashed avo at home for about $AU2.10, instead of $AU18 a your local cafe. That’s a savings of $AU15.90 or 88% from your typical cafe prices. 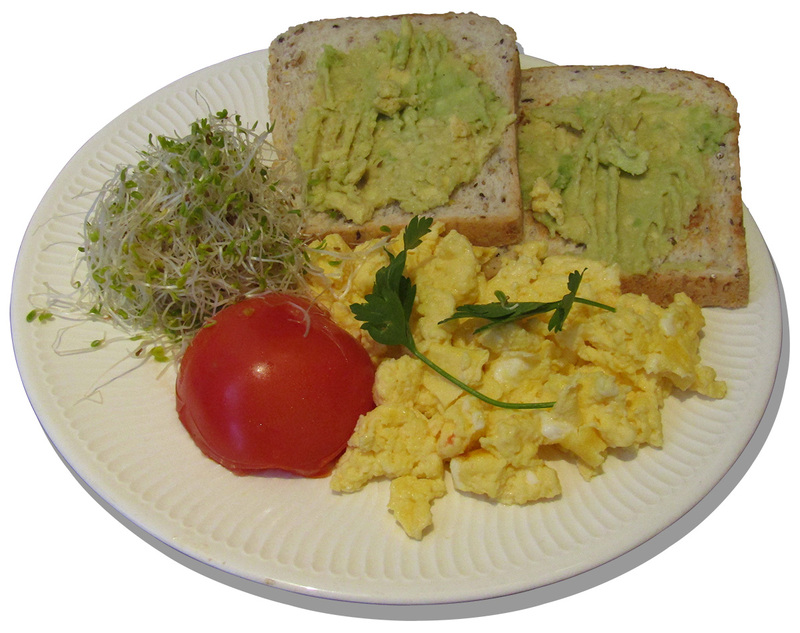 Homemade smashed avo – save approximately $AU15.90 or 88%. Next time you fork out some cash for the next smashed avo at your local cafe, think about where the savings could be invested instead. Perhaps into your mortgage principle or a dividend stock with a supermarket chain where people will shop during an economic down turn? Perhaps that is a way to save for a mortgage down payment? That’s for you to consider over your next smashed avo..